There may be decorations in some shops already, but we all know Christmas shouldn't start until December. 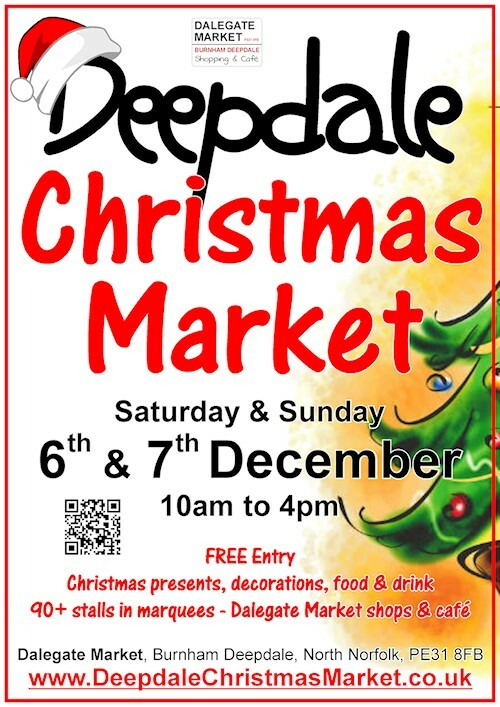 That's why Dalegate Market waits until the first weekend of December to hold the ever popular Deepdale Christmas Market. And what a way to start Christmas! This year there will be some 90 stalls offering a fabulous selection of presents, decorations, food & drink - a huge gathering of independent traders offering unique products, the perfect excuse to visit the beautiful North Norfolk Coast. In its 6th year, Deepdale Christmas Market has grown up around the lovely shops and café of Dalegate Market in Burnham Deepdale, drawing in visitors from far and wide. In 2013 it was thought Japan was the furthest visitors came from, however just after Christmas a New Zealander emailed to say how much they enjoyed their visit. It seems Deepdale Christmas Market can truly be described as an International Event, not bad for a village with fewer than 30 permanent residents. The Market wraps around the Dalegate Market site, housed in large marquees and St Mary's Church across the road. The organisers spend a lot of time getting the mix of stalls right, making sure there is very little duplication and that the quality is excellent. "It's wonderful reading through the applications and piecing the jigsaw together. The only bit I don't enjoy is having to say no to those who haven't been successful, but we only have 90 spaces and hundreds apply." said Estelle Townshend, one of the organisers. "We mix up the stalls a bit each year to keep the market fresh." Having completed the stall choices, the hunt is on for entertainment to add Christmas cheer to the event. Some of the popular musicians from 2013 are returning, including The Quaysiders, Nelson’s Shantymen, the Adhoc Brass Band Collective and Claire Lawrence … It's not too late to apply, and acts like string quartets, carollers and others are more than welcome to apply on the website. "It's almost impossible to choose favourite stalls as we have a lovely bunch of stall holders with fantastic products. I always look forward to the cheese, beer and salami stalls, but this year Norfolk Deli are bringing German Christmas market products which will certainly get the taste buds working. Martin at Bringing The Outside In always sources great Christmas decorations, the glass and jewellery stalls are superb, and we are really pleased with the selection of homewares. Hopefully the smell of mulled wine, cider and the great food available from the café and food stalls will help guide people to Burnham Deepdale. I think we've got a great mix of independent traders and there will be something for everyone." said Jason Borthwick, another of the organisers. The Deepdale Christmas Market is easy to find. Burnham Deepdale is approximately half way between Hunstanton and Wells-next-the-Sea on the A149 Coast Road, just over the hill from Burnham Market and on the Coasthopper bus route. It’s FREE Entry and FREE Car Parking on a field and farm yard next door to the site. Gates open at 10am on both Saturday 6th and Sunday 7th December.